During online observation mode, the function block “Visualisation” displays the buffered content of the "Dynamic Text" that is connected to its input. When processing the user program, the “Dynamic Texts” can permanently change its size. Again and again new memory is allocated and old one is freed. The addresses of the texts change all the time and an error-free online visualization is nearly impossible. Therefore an indirect visualization is used for the “Dynamic Texts”. The target function of the visualization block copies a part of the connected “Dynamic Text” into a buffer. This buffer is cyclically read by the programming system and the content is displayed in the function block. The parameter dialog can be used to change the width and the height of the function block. If only the width is increased, more characters can be displayed. By changing the height, the font size is automatically adapted, i.e. the displayed characters get bigger when the function block height is increased. The buffer size and the starting position of the text part are configured in the parameter dialog. The buffer size is limited to 128 bytes. When using a target system with Unicode support the “Dynamic Texts” are coded in the UTF8 format. 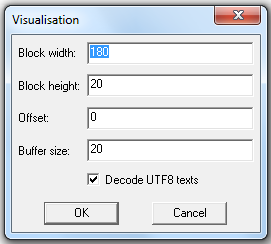 The display of the decoded Unicode texts or of the raw data is selected with the dialog option “Decode UTF8 texts”. Invalid texts are always displayed in the raw format.